under the TRAINING menu option. 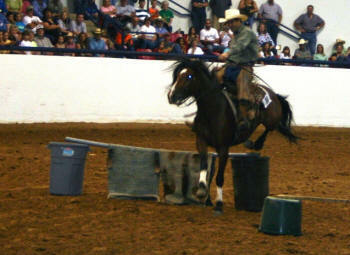 You may never have imagined how good Mustangs can be! 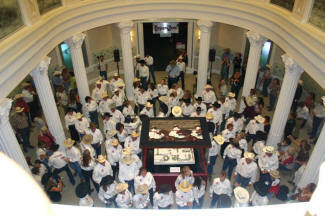 This poor photographer was stuck up on the third floor balcony, but somewhere down there Paula Carr is delivering the opening speech for the Extreme Mustang Makeover festivities at the National Cowgirl Hall of Fame in Ft. Worth, Texas, on Friday night, September 21, 2007. 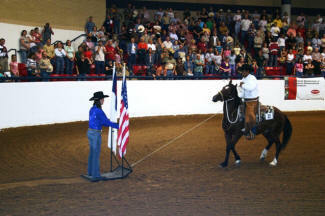 Mustang Heritage Foundation President Paula Carr, of Cross Plains, Tennessee, spoke to approximately 650 visitors at the National Cowgirl Hall of Fame on the evening of September 21, 2007. 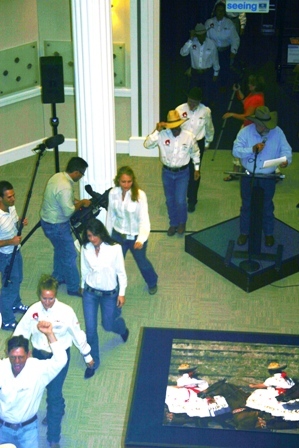 The big media event was covered by National Geographic, Newsweek, Discovery, and RFD-TV and many more TV stations in the USA. Ms. Carr opened the fun filled weekend for 100 Wranglers with 100 Wild Horses trained only 100 days to compete in the first ever Extreme Mustang Makeover. 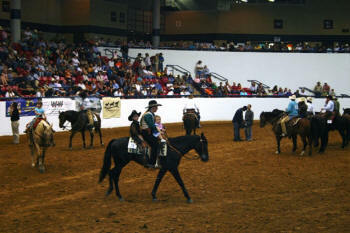 The competition began on Saturday, September 22 at the Will Rogers Equestrian Center in Fort Worth Texas. 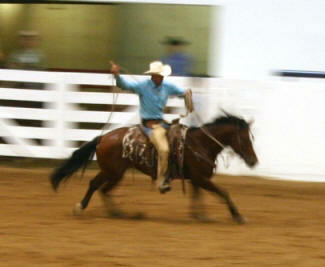 Ribbons and prize money were awarded the top trainers with the best trained horses. 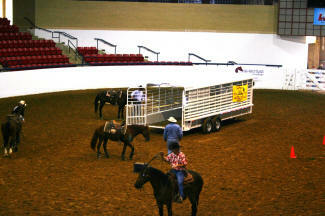 Sunday , September 23, the trained animals were put up for adoption to the public. 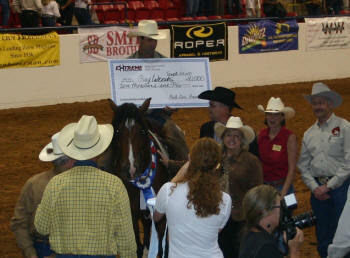 A 3 year old horse named Hail Yeah was adopted by the town of Norco California for $ 50,000.00 . 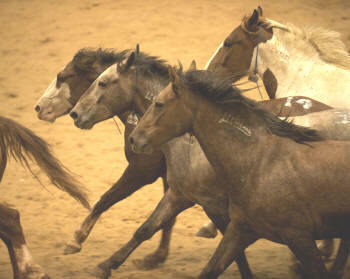 Many horses were purchased back by their trainers, a testimony to the strong bond developed between the mustangs and their trainers, many of whom had worked with domestic horses their entire lives but had never been near a wild horse before taking on this challenge. 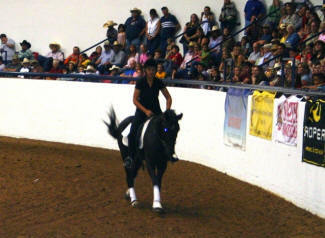 Emotions ran high with the crowd of 1200 people and trainers. 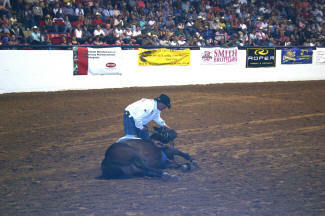 Average cost per horse was $3,200. The Bureau of Land Management said this was the best thing that has come down the pike for the horses since the beginning of the adoption program in 1977. 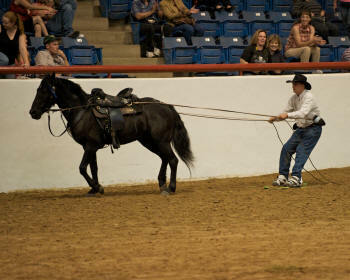 Randall Carr , a trustee of the Foundation, also attended and worked with the trainers and highly well known judges throughout the event in Texas. 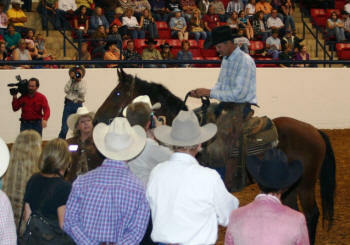 Road To The Horse winner Chris Cox surprised the packed arena to assist the trainers and help with the final judging . 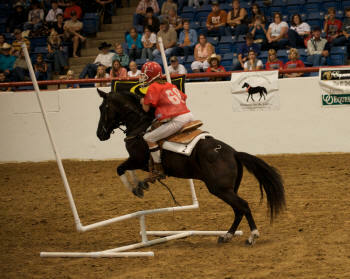 The Carrs state that the Foundation will be working on doing another Extreme Mustang Makeover with BLM in the East in the coming year. 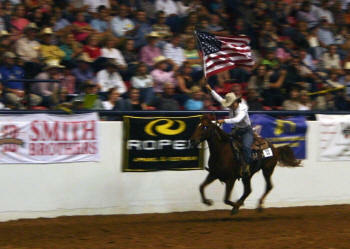 Abel Garcia presented a unique opening ceremony, pulling a flags-and-cowgirl-laden sled with his Mustang. 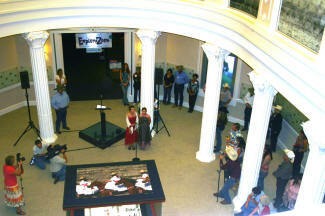 Finalist Dwight Bilyk talks with reporters and Mustang Heritage Foundation Board members. 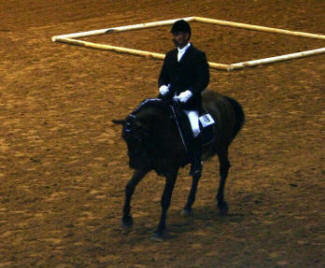 Evija Aunina from Wyoming (and Latvia) was one of only two English riders, and she placed 4th overall!